Advertisements paid for by tobacco companies say their products are deadly and were manipulated to be more addictive. If you read a newspaper on Sunday, there's a good chance you came across a full-page ad warning of the dangers of smoking. The stark messages with black text on an otherwise blank page tell readers that cigarettes kill 1,200 Americans every day. The same messages start to run Monday evening on prime time television. The ads are more than a decade in the making. They're the result of a 2006 judicial ruling in a lawsuit filed by the federal government that found that cigarette makers deliberately misled the public about the dangers of smoking. And the tobacco companies and anti-smoking advocates fought over every word. But experts in public health say they may not be all that effective. "If the intention was for these ads to have some dampening effect on smoking initiation, or just continuing to smoke, I would say it won't work," says Nora Rifon, a professor of consumer psychology at Michigan State University. The ads are pretty weird. The ones that are running in newspapers in print and online feature black text on a white background. They're known as "tombstone" advertising because of that simple design, Rifon says. On television, viewers hear a disembodied voice that sounds like its computer generated or manipulated. It starts by announcing that four big tobacco companies are behind the messages. "A federal court has ordered Altria, R.J. Reynolds Tobacco, Lorillard and Philip Morris USA to make this statement about the health effects of smoking." Then the bad news begins to flow. "Smoking causes heart disease, emphysema, acute myeloid leukemia and cancer of the mouth, esophagus, larynx, lung, stomach, kidney, bladder and pancreas." That's just part of one of the five ads. The others warn of the dangers of secondhand smoke and inform viewers and readers that low-tar and light cigarettes are just as dangerous as regular ones. Along with the health warnings, there's an admission. "Cigarette companies intentionally designed cigarettes with enough nicotine to create and sustain addiction." The cigarette companies were ordered to run the ads back in 2006 when U.S. District Judge Gladys Kessler found they had conspired to cover up the risks of smoking. In her ruling she said the cigarette industry "profits from selling a highly addictive product which causes diseases that lead to a staggering number of deaths per year, an immeasurable amount of human suffering and economic loss and a profound burden on our national health care system." 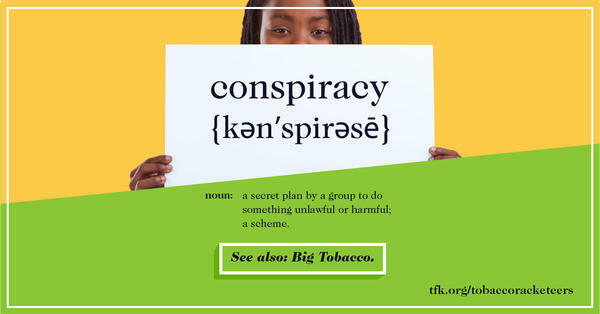 The companies appealed the wording of the ads multiple times until the language was finalized earlier this year, according Matthew Myers, president of The Campaign for Tobacco Free Kids. The final wording "is in fact the result of literally hundreds of hours of negotiation with the Department of Justice and the Campaign and other public health groups arguing that it's that the statements be stark, be accurate, and be detailed enough to have an impact when they're heard," Myers says. His group was one of the plaintiffs, along with the Justice Department, in the 1999 suit against the tobacco companies. "Very few people know that the court found that the tobacco industry intentionally manipulates cigarettes to make them more addictive," he says. That's likely to be the message with the most impact, says Kenneth Warner, an emeritus professor in public health at the University of Michigan. "That may be surprising to smokers and may be very irritating to them," he says. The messages also serve as a confession of sorts from the tobacco companies, he says. "They know what they have been doing for decades," Warner says. "They know that they have been killing their customers and they know that they have been trying to addict their customers and keep them addicted." But he says the stark messages, with the disembodied voice, white screen and simple scrolling letters, seem designed specifically to be ignored. "As an advertising design this is a very weak one," he says "This is kind of designed not to get the message across because there's no imagery associated with it." A live spokesperson, perhaps even a tobacco company executive, reading the words, would have been more effective, he says. The tobacco companies declined to provide a spokesman to be interviewed for this story. But in written statements, Altria, which owns Philip Morris, and Reynolds American, which owns R.J. Reynolds and bought Lorillard in 2015 and merged the two companies, say the industry has changed and is now better regulated and more responsible. "We're focused on the future," said Altria's executive vice president Murray Garnick in the statement. The company, he says, is "working to develop less risky tobacco products." The company says the number of teens who smoke has fallen to historic lows. which matches data from the Centers for Disease Control and Prevention. But that number doesn't include the big increase in teenagers using other nicotine delivery systems such as vaping. Rifon says the companies' decade-long fight over the new ads has worked to make them almost meaningless. "The tobacco industry got what they wanted by negotiating and stalling all this time because they knew the longer they waited the more likely it was that whatever they had to do wasn't going to matter." If you read a newspaper yesterday, you might have seen a full-page ad warning of the dangers of smoking - black text on an otherwise blank page telling people smoking kills about 1,200 Americans every day. You'll be seeing and hearing more of them, too. Tonight, similar messages will begin airing on prime-time TV. The ads were court ordered more than a decade ago. NPR's Alison Kodjak reports. ALISON KODJAK, BYLINE: The ads are pretty weird. They use a voice that sounds a bit like Apple's Siri but not quite as friendly. And they start like this. COMPUTER-GENERATED VOICE: A federal court has ordered Altria, R.J. Reynolds Tobacco, Lorillard and Philip Morris USA to make this statement about the health effects of smoking. KODJAK: Then the bad news begins to flow. COMPUTER-GENERATED VOICE: Smoking causes heart disease, emphysema, acute myeloid leukemia and cancer of the mouth, esophagus, larynx, lung, stomach, kidney, bladder and pancreas. KODJAK: Along with the health warnings, there's this admission. COMPUTER-GENERATED VOICE: Cigarette companies intentionally designed cigarettes with enough nicotine to create and sustain addiction. KODJAK: The ads - there are five in all - will appear in print newspapers, on newspaper websites and on network TV over the next year. The cigarette companies were ordered to run the ads back in 2006 when a federal judge found they had conspired to cover up the risks of smoking. The company's appeals lasted until this year. Matthew Myers is president of the Campaign for Tobacco-Free Kids. He says the tobacco companies fought over every line in the ads. MATTHEW MYERS: It is in fact the result of literally hundreds of hours of negotiation with the Department of Justice and the campaign and other public health groups arguing that it's important that the statements be stark, be accurate and be detailed enough to have an impact when they're heard. KODJAK: His group was one of the plaintiffs along with the Justice Department in the suit against the tobacco companies. He says the ads, which the companies and courts call corrective statements, may seem like old news to a lot of people but still have information that may surprise the public. MYERS: Very few people know that the court found that the tobacco industry intentionally manipulates the cigarettes to make them more addictive. KODJAK: That's what struck Kenneth Warner of the University of Michigan. He says the messages are a confession of sorts from the tobacco companies. KENNETH WARNER: They know what they have been doing for decades. They know that they have been killing their customers and that they know that they have been trying to addict their customers and keep them addicted. KODJAK: But he says the stark messages with the disembodied voice, the white screen, the simple scrolling letters seem designed specifically to be ignored. WARNER: As a - an advertising design, this is a very weak one. This is kind of designed not to get the message across because there's no imagery associated with it. KODJAK: He says he would have liked to see a person, maybe even an executive from a cigarette company, deliver those messages. Nora Rifon, a professor of consumer psychology at Michigan State University, agrees. NORA RIFON: The form of these ads is what we would call tombstone advertising. KODJAK: Because of the plain text on the blank background. RIFON: If the intention was for these ads to have some effect or a dampening effect on smoking initiation or just continuing to smoke, I would say it won't work. KODJAK: The tobacco companies declined to be interviewed for this story, but in written statements, Reynolds American, which acquired Lorillard in 2015 and merged it with R.J. Reynolds, and Altria, which owns Philip Morris, say the industry has changed and is now better regulated and more responsible. But Rifon says the company's decade-long fight over these ads worked. RIFON: They knew the longer they waited, the more likely it was that whatever they had to do wasn't going to matter. KODJAK: That's because not many young people read the paper or regularly watch network television. Alison Kodjak, NPR News.